Divide the labor/multiply the reach. Kill One Kill Twelve Kill Millions Kill Billions. By Bob Nichols on June 9, 2012. Play the Cards You Draw … by Bob Nichols. …For the weapons inventors who patented the device it was a real victory; for the two wealthy weapons research labs, it was like the Holy Grail of Christ. The scientific write up, or Abstract, is included in the “D.I.M.E. BOMBS” article as well as below in Sources and Notes ”The cancer with the jaw-breaking name was featured in this writer’s Oct 30, 2010 article “D.I.M.E. BOMBS: Closer to Fallajua’s Puzzle.” Developed jointly by the Lawrence Livermore Nuclear Weapons Lab and the US Air Force Research Labs, the 250 lb class weapon, named the GBU 39, delivers a perfect and phenomenal 100% cancer rate to its victims…READ MORE ……. …Early in the 1950s the American spy agency, the CIA, adopted an assassination policy. The spy agency was created in 1947 and is sometimes known as the CHAOS Agency….READ MORE ……. … “Coincidences” happen in children’s fairy tales and are for dull, childlike, gullible adults….READ MORE ……. It is an open joke and a term of extreme contempt that, in Japan, politicians and other professional liars for hire say “Smiling people do not get radiation poisoning.” Note: This stuff gets ever more bizarre as the politicians try and fail to explain away the terrifying practical genocides of the always firing and wildly out of control nuclear reactors … READ MORE ……. ….The eternally brain dead President of MTSU stated in a prepared release that only four (4) isotopes were announced by Hillary’s State Department in the far away Never-Never Land of Washington, D.C., and posed no problems. He trusted Hillary. Why? All the moronic President of Middle Tennessee State had to do was drop in for coffee at Tennessee’s own Oak Ridge Nuclear Weapons Lab just 153 miles away. The people who should know these kinds of things say nuclear radiation kills the youngest first. 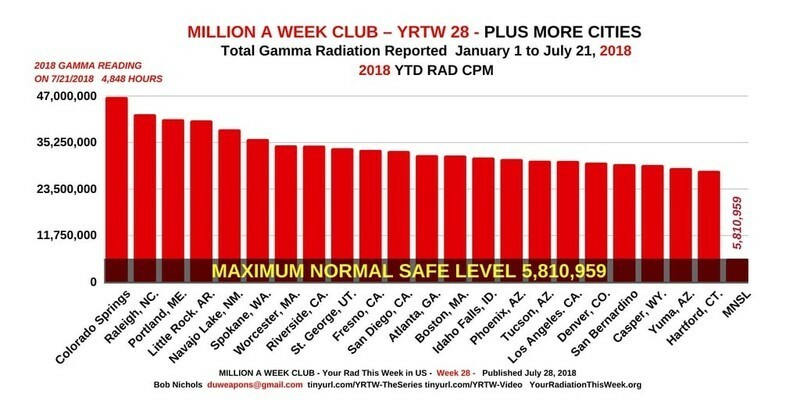 As predicted, Normal Live Births are declining around the world since the Japan Radioactive Contagion spread throughout the Northern Hemisphere within days of 3-11-11 READ MORE ……. …However, once set in motion, the Radioactive Contagion is unstoppable and now affects all humans, animals and plants on earth. Even spiders spin radioactive thread. There is no end in sight for the illness and death directly caused by the people who design, finance, build, operate and maintain the nuclear killing machine. Truly, atomic reactors are merely giant Stationary Nuclear Weapons; perfect for killing and maiming lots of people…READ MORE ……. All the pro-nuke apologists, frontmen and traitorous women in the world don’t change one data point of the horrifying reality; no matter how hard and often they try to “future-tense” the current and ongoing Extinction Level Event. Truth is, it has already happened and all the pro-nukers are to blame. The politically correct apologists who say nukes can be managed are disgusting and in it for the money. Trials anyone? Then, we can Hang them all. Yea, all legal like…..” READ THE REST……. Bob Nichols is a Project Censored Award winner, a Veterans Today columnist, a former correspondent for the San Francisco Bay View newspaper and a frequent contributor to various online publications. He reports on war, politics and the two nuclear weapons labs in the Bay Area. Nichols is writing a book based on 20 years of nuclear war in Central Asia. He is a former employee of an Army Ammunition Plant. Watch the entire video here – it’s read for you. 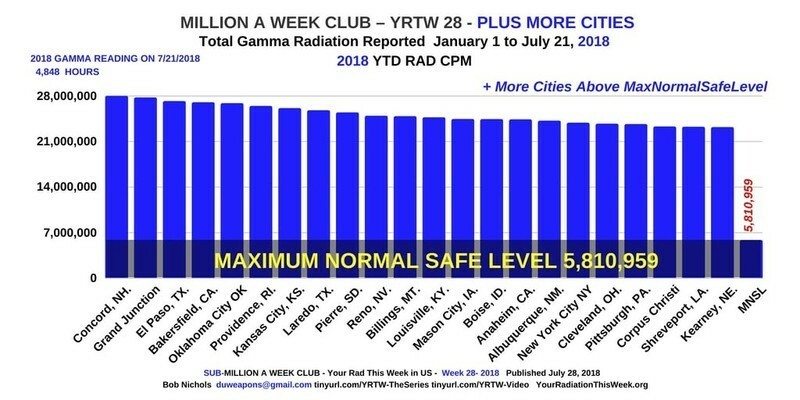 Subscribe and share Your Radiation This Week TOTAL GAMMA RADIATION – YEAR TO DATE USA TOTALS and consult the Table of Poisoned American Cities in current Nichols’ works. Google it. WE ARE THE MEDIA NOW – so be it! You are not alone! Looks like only 40 people have read the latest …. since Saturday morning?? D’oh! Click through again —- it seems to be working now. Share with your smart friend(s) and continue to #DodgeTheRads! It’s dangerous out there! If it happens again, check these Facebook pages for newest links, or review earlier articles while the VT guys fix things again. Let’s have a little marathon soon with repurposed-postings on these pages, for your convenience at 11 and 11…. PM and AM….for a while. 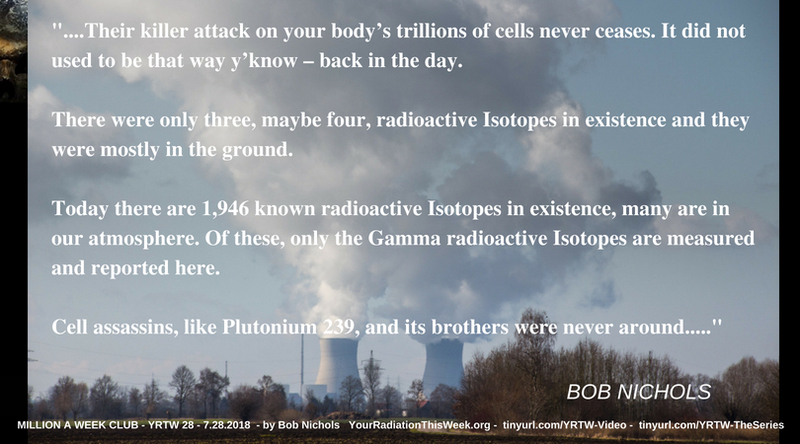 Bob Nichols Said WHAT About Your Radiation This Week? Sources at the highest levels of America’s intelligence community warned Veterans Today that President Trump acting with select members of his team including General McMaster, ordered Veterans Today taken down. Veterans Today has been subjected to national security level malicious software hacks for nearly 12 hours. “Trump Humilated: Syria Shoots Down 34 of 59 Cruise Missiles, Russia to Upgrade System Soon” ??? WHAT??!!! Trump Orders VT Eliminated?? WHY? Alas…. All Nuclear Reactors Leak All of the Time, Some More Than Others, ON PURPOSE. Fukushima is not a leak. Continue to Dodge The Rads!!! And other dangerous things!